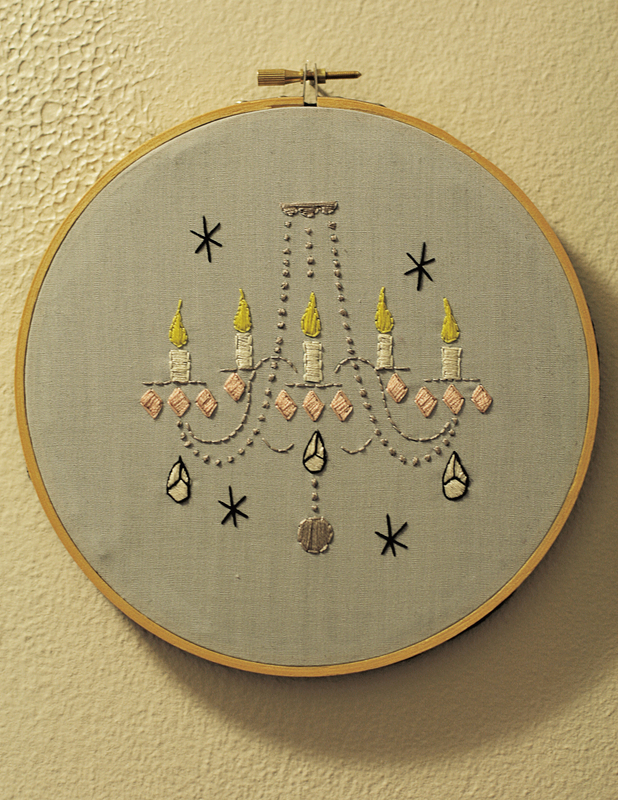 I made this embroidered chandelier piece for my sixteen year old niece. Recently she moved into her own room and I wanted to make her something to show her how mature I think she is. An "adult" type of gift. I bought the Sublime Stitching Craft Pad two years ago and I can't believe I am still using it! I've made so many projects using her lively iron-on embroidery designs. I ironed on the design on a quilter cotton, gray fabric and placed it in a wooden hoop. Once the project was complete I cut a piece of felt the same size as the hoop and hot glued it to the back. I love how simple it is. And it didn't take a lot of time, it would be easy to whip up a few more to have on hand and give as gifts whether it's a birthday or housewarming. Here are a few more examples of embroidered pieces in hoops and simply hung on the wall, I love the way this looks. And clearly the Sublime Craft Pad is worth the $15 bucks. You did a beautiful job on this chandelier! Your niece must love it! Thanks so much! And thank you for reading.